Google may have given you an additional free 2GB of Drive storage for life this morning, but what if you happen to be a heavy Windows user (or someone who loves free sh*t) and would rather have bundles of free storage added to your OneDrive account? If you somehow fit that description or situation (most of you will on some level), then well, we have a deal for you. 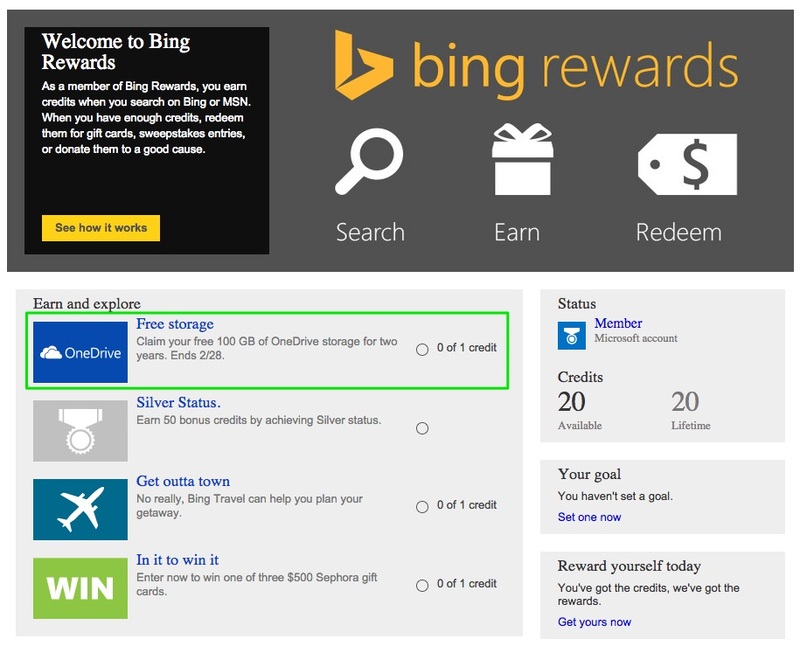 Through the Bing Rewards program, you can secure an additional 100GB of free OneDrive storage for the next two years, basically by doing nothing…other than joining Bing Rewards…and then clicking a button. Make sure you have some type of Microsoft account. Sign-in to it and then cruise over to the Bing Rewards site. Agree to their silly terms. Once inside, use one of the 20 credits they have given you to claim your free 100GB of storage. Your OneDrive storage limit should immediately increase. You can grab the OneDrive Android app from Google Play to manage the world.